Whenever something is labelled “the future” of a particular art form, it’s probably best taken with a grain of salt. Anybody who thinks they can predict exactly how the winds will blow through a form – especially one as fickle and rigid as opera – is usually mistaken. 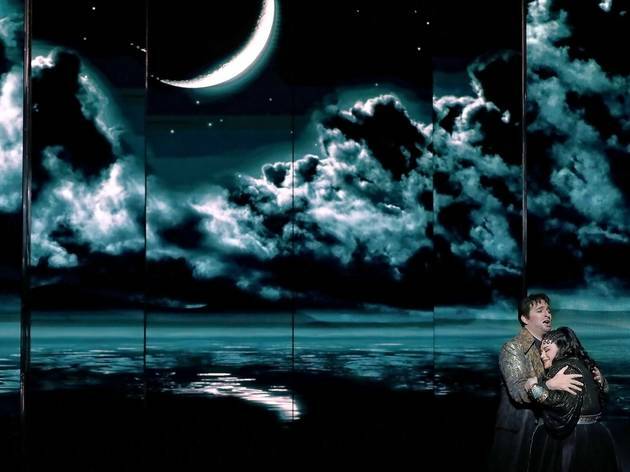 It would seem Opera Australia’s artistic director Lyndon Terracini has got an idea about what the future of grand opera might involve: slick, digital sets made up of high definition LED panels. 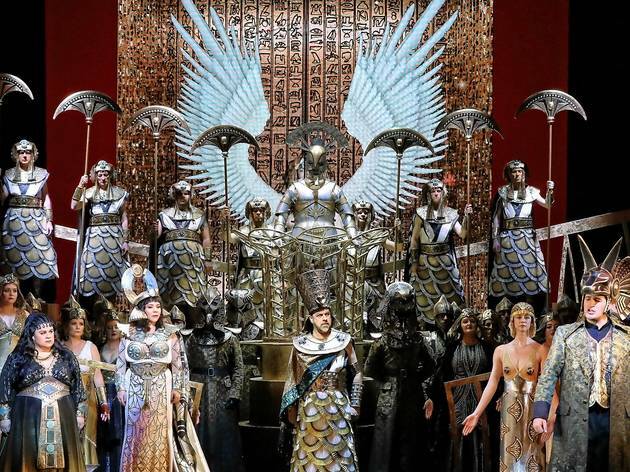 Opera Australia’s new production of Aida uses ten massive, stage-filling screens that slide in and out of place and spin, creating a captivating cinematic experience that fuses live performance and video. 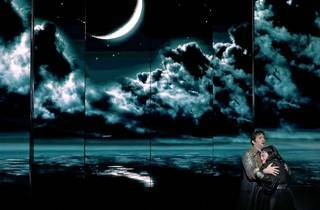 Debuting the company’s first digital production was a significant gamble; Opera Australia certainly isn’t the first opera company in the world to use projections, but there’s a big investment behind the technology and already two more productions commissioned that will use it. If the opening night response is anything to go by, it’s a gamble that will pay off in the coming years. Italian director Davide Livermore is clearly of the opinion that “more is more” and has created a production that undoubtedly succeeds. There are endless sparkles, gold gilding on just about every surface, huge headdresses and some of the loudest singing (and I mean literally, in decibels) I’ve ever heard in the Joan Sutherland Theatre. 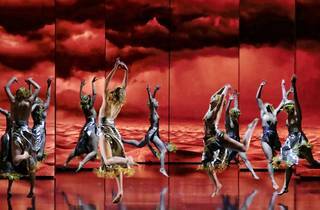 He absolutely leans into the melodrama of the piece with all his staging and choreography. (Although there’s a question mark hanging over the choreography for the female dancers, who seem to be embodying some sort of nymph, crossed with an Amazonian warrior and a horny zombie). You could call it a triumph of questionable taste, but it’s a triumph nonetheless and the glitziest piece of theatre to premiere in Australia this year. 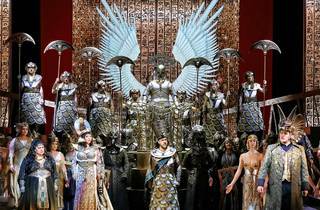 Visually, it’s got more in common with a Katy Perry or Kylie Minogue concert than traditional opera. In one moment, giant digital snakes slither around the edge of the stage; it’s more than a little Taylor Swift. Amongst the spectacle, Livermore tells the story with absolute clarity: Aida (Amber Wagner) has been enslaved by the Egyptians, who have no idea that she’s the princess of Ethiopia. But she also happens to be desperately in love with Radamès (Riccardo Massi), an Egyptian captain who’s leading a war against her people. 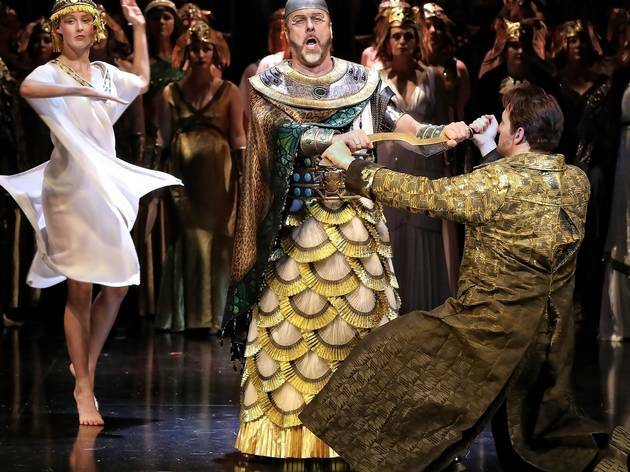 Complicating things even further is the fact that she has a rival for Radamès’ love: the Egyptian princess Amneris (Elena Gabouri), who Aida serves. 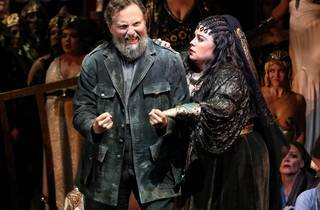 Terracini has opted for singers with huge dramatic and vocal presence, and none are eclipsed by the size of the production. 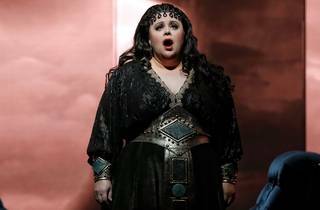 American singer Amber Wagner (who coincidentally happens to be a superb Wagnerian soprano) makes a huge impact with her role debut as Aida. She doesn’t always have the vocal nuance of some other Aidas, but it’s a thick and lusty tone that soars over the chorus and orchestra. Her ‘O patria mia’ is delivered with plenty of intensity and she’s entirely believable as a woman facing the choice between her love for country and the man she loves. 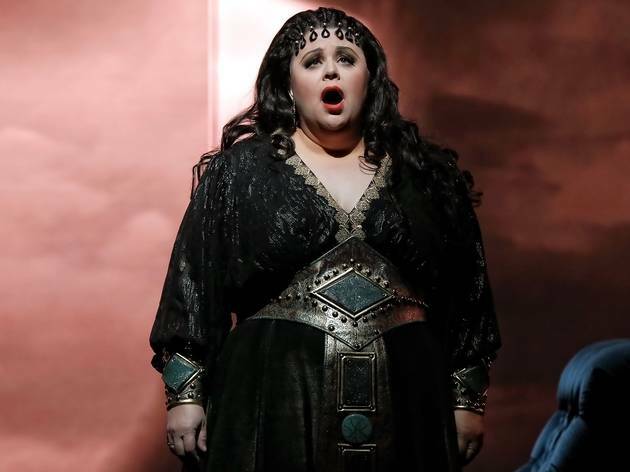 Elena Gabouri is every bit as bold – and loud – as Amneris. Not only does she know how to swish a cape with all the flair of Gloria Swanson, she’s an absolute firecracker of a singer, with plenty of gutsy chest tones fleshing out the character. 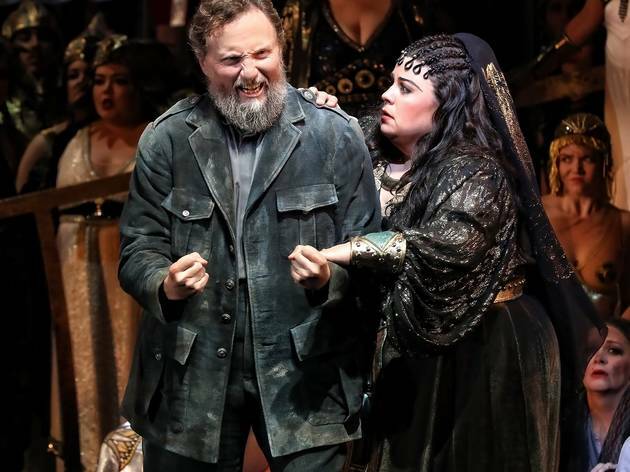 Riccardo Massi manages to hold his own against these two women and delivers a heroic performance, with beautifully even and passionate singing. There’s also great work from Warwick Fyfe as Amonasro, while Jud Arthur is appropriately imposing as the King of Egypt (his costume is somewhere between the Tin Man and a Mardi Gras float). 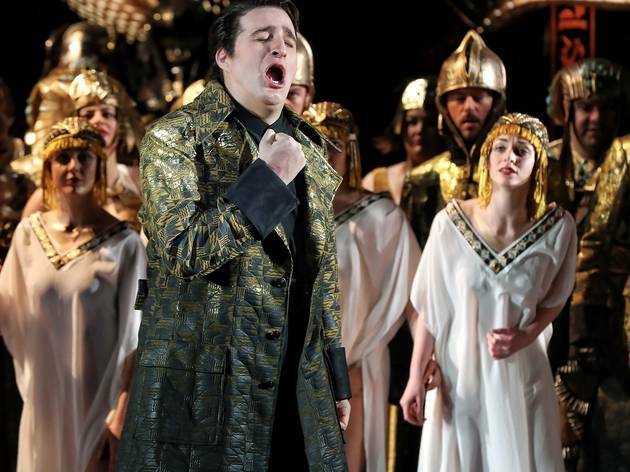 Similarly, conductor Andrea Battistoni leads the Opera Australia orchestra through a roaring performance of the score, wringing every ounce of melodrama from Verdi’s big chorus scenes (the Opera Australia chorus is in fine form) as well as his more intimate moments between Aida, Radamès and Amneris. The drama emanating from the pit is in perfect step with all that’s happening on stage and screen. We’re pretty cynical about replacing physical sets with video; the point of theatre is that it happens in front of your eyes, in three dimensions. But the way the LED panels move around the space – and are augmented with physical setpieces and a mass of bodies – means you never feel like you’re just at the cinema. The sets (designed by Giò Forma) and video (by D-Wok) take us from the halls of political and religious power to the banks of the Nile, mashing up ancient Egyptian imagery with contemporary design, creating a futuristic fantasy version of Egypt. Costume designer Gianluca Falaschi has taken these cues and amped everything up to 11. A production full of Egyptian and Ethiopian characters portrayed by white performers should probably ditch the cornrow wig, but the designs are undeniably beautiful. 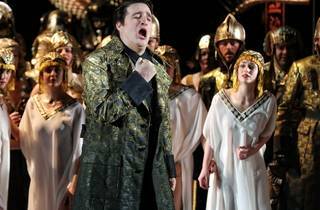 So is this the future of opera? It’s really impossible to know whether this sort of technology will be fully embraced by opera companies. It certainly wouldn’t work with every piece, and I’m sure there’ll be a hunger for productions with physical sets for as long as live theatre exists. 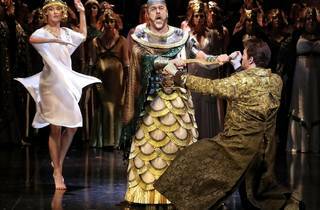 But there’s no denying the extraordinary theatrical thrills of this Aida, which captures your heart like all the best pieces of theatre. We haven’t had a more exhilarating night at the opera in a long time.